Adam Ryder runs at the Featherstone defence during Dewsbury's terrific 32-22 victory last Sunday. 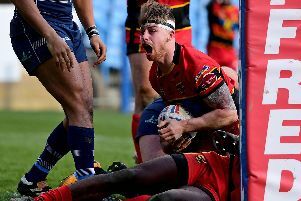 Dewsbury Rams coach admitted his side finally proved what they have been threatening all season as they stunned Featherstone Rovers with a terrific win last Sunday. The Rams had been in positions to win against Championship high fliers York, Toronto and Sheffield in recent matches but were unable to get over the line however, they finally put together a complete performance to gain a second victory of the season. Greenwood said: “We have been in that position quite a few times, even when the final hooter went I was still thinking we might throw this one away. “I think for the efforts the boys have put in, in a lot of the games not just today, we did need that win and obviously, that is a big win. “For where we have been at, and Featherstone’s home record and the results from last season, it is obviously a massive shock to everyone else outside our dressing room. “We looked really good. In the other games, we dogged it out, made it tough for the other team and stuck in there by kicking penalty goals and just crashing over for the odd try, whereas (at Featherstone) we looked good with the ball in hand. “There was some really good signs of the half-back combination working and we have got some big ball-playing guys out wide as well. “We feel like we are a good side and we changed the way we played to combat what Featherstone would throw at us and cause them some problems. “There was a patch where we got in front and then got behind very quickly and I’m sure the lads were doubting if we were going to crumble and throw it away but there was good determination from the boys, because we were down to 12 men. “To come to a place like Featherstone and come away with something, you need one to 17 to put in a massive shift. “Some played longer than others, obviously, but whether they started or came off the bench, they all put in massive shift and everyone across the 80 minutes performed well. “We scored a couple of nice tries and looked decent throwing the ball around over the 80 minutes and that is probably the best performance and definitely the best result. “We got beat by teams above us, beat Swinton and drew against Barrow. This is the first result today where we have done something that probably surprised people.